For a few years now I have been wanting to start a complete N64 collection. I already have ruffly about 90 games out of the 296 American released titles. However as of recently I aquired a box of 53 Super nintendo games all in there original boxes with manual. It was at that moment I realized, not only do I want a complete N64 collection but I want a complete collection boxed. This is the hard part thoe, I have about 90 games but only 12 boxed as of right now. I have about 25 on order and I am going to keep at it for about the next year or 2. Most titles are pretty reasonable but there are a few that are going to cost me a pretty penny with the worse one being clayfighters 63 1/2 sculptor's cut currently going for $1600 as of today with the box and manual. This is not going to be easy but it should be fun. I have tried to talk to co workers and other friends about this epic task. But not to many people understand the mindset and dedication of a collector. Nor do they care. Hopefully the few that read this shall understand If anyone on the site has some extra boxed games or N64 boxes and manuals up for sale or trade please message me and keep me in the loop. Thanks everyone. If everything has gone to plan. Below is the sad 12 lonely Games boxed I currently own at my house. It's always difficult to collect for a cartridge based system who's games came in cardboard boxes, but I commend you. Good luck! I too am collecting a CIB N64 collection. I don't have any boxes to spare now, but I think I have a few manuals. If I come across any I will let you know and I would appreciate it if you could do the same for me. Seems like this becoming a popular console to collect for. Talk to techwizard, he might have some advice since he's going for a CIB N64 set. I never kept any of the boxes or booklets when used to play N64 as a kid. If I had any I would have been glad to help. I have always hated that my collection of games has been so empty without boxes. I see peoples collections online all the time and I just think how amazing it would be to have alot of them with the games. 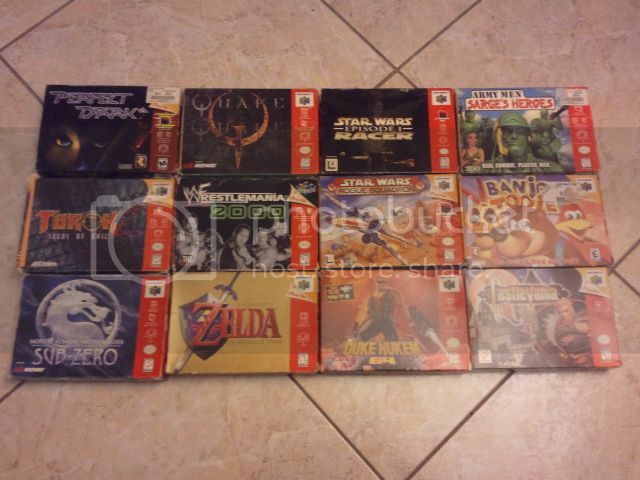 Also a complete CIB collection of N64 games is going to be awesome. Any advice or anything on the N64 will be awesome. Wempster if you private message me maybe I can add you on facebook or something and we can communicate there. It is a little easier. Manuals for it tend to come up once or twice a year - make sure you keep an eye out on NintendoAge, as that's where I've seen them mostly. It's too bad you didn't start this back in 2002-4. Gamestop, Blockbuster, and yard sales were flush with that stuff. I had a friend who managed it, and the hardest thing wasn't specific games if I remember, but getting them with bright, non-crappy boxes. Good luck though and keep us in the know. @Tadpole13: Its easier to find a CIB for that game than just the manual. I think a lot of people do what you just did and then end up later buying a CIB copy and then selling their CB copy to recoup some of the cost. Wow, Sculptor's Cut has exploded in price. I really, really wish I bought a CIB copy a few years ago when I had the chance. Good luck on your goal, Tadpole. I always wanted a CIB N64 collection, but I gave it up a few months ago. I just started Ebay with my first purchase being on the 12 of Feb and I already have 37 different N64 games on order. To add to the 12 I have posted int he photo. I really want to get a complete collection. I am expecting to get it done in a year or 2.